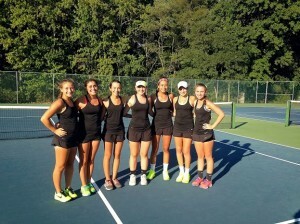 The playoffs weren’t scheduled to begin until Oct. 6 for Moorestown High School girls’ tennis, but the team has already won some hardware. The Quakers established themselves as a serious playoff contender in late September, winning a pair of tournaments in a span of six days. First, the Quakers won the Moorestown Classic on Sept. 20, defeating Cherry Hill East, 3–2, in the championship. The next week, Moorestown won the team title at the Burlington County Open. Head coach Steve Dickerson said the team’s success is mostly due to a lot of work the team put into the preseason. The Quakers returned most of their starting lineup from last season, including all three singles players. Last season, Moorestown won the South Jersey Group III title, but was unable to win a team championship in the Moorestown Classic or Burlington County Open. With most of the team returning, Dickerson encouraged his players to put in extra work in regard to conditioning and skill building in the offseason. The extra work appeared to pay dividends in preseason. Dickerson had the team play challenge matches prior to the regular season where each of the players faces off to see what positions she will play in the year. As he watched the matches, Dickerson realized this year’s team would be very competitive. “In challenge matches, everyone had close matches and a lot of them went into three sets,” he said. Dickerson feels his three singles players could be one of the deepest trios in the state. №2 singles player Alex Boone and №3 singles players Anna Mary Shetler have dominated their competition, losing just one regular season match each this season. They have been huge supports for №1 singles player Emily O’Neil, who has lost just two regular season matches despite facing each opponent’s top player. Dickerson is very impressed with Shetler’s improvement in 2015. Shetler won the №3 singles individual title at the Burlington County Open for a second straight year. Boone had played №1 singles in 2014, but swapped spots with O’Neil after Dickerson said moving down to №2 singles did not have a negative effect on Boone. Moorestown hasn’t had issues beating South Jersey schools, but playing North Jersey schools, especially in the postseason, has been a challenge in the past. In the Group III semifinals last year, Moorestown was swept out of the playoffs with a 5–0 loss to Millburn. To counter this, the Quakers have faced some competition from outside the region. They opened the season against Lawrenceville High School and played Westfield High School in the Moorestown Classic this year. Dickerson believes the Quakers’ depth and experience against North Jersey schools may be the missing puzzle piece to the team’s first state final appearance since 2007. “We’re strong and at the same time we can still improve quite a bit,” he said.